Small World PriceCompare, Buy this board game at the Lowest Price. In Small World, there are over a dozen races running around, and the world is way too small to fit them all. Tensions are heating up and a few races are going to get clobbered. Take control of your favorite races, from sorcerers and orcs to ratmen and humans. Use them to wipe the other races off the map before their power runs out and their civilization goes into decline! 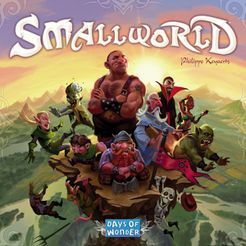 Small World is a board game by Philippe Keyaerts, designer of the board game Vinci, of whichSmall World is a remake. Where Vinci features the great civilizations from Earth's history, the stars of Small World all come from the fantasy world. The zany civilizations in the game range from the peaceful halflings, elves and humans to the darker sorcerers, skeletons and ghouls. Even exotic races such as giants, amazons and ratmen make an appearance. The gameplay in Small World (and Vinci) is similar to that in the hugely popular Riskboard game, in that the objective of the game is to control as many regions on the map as possible by attacking other players. That's where the similarities end though. Where the combat in Risk is based on dice rolls, the results of combat inSmall World are pretty much fixed and not dependant on luck. In addition, Small World features over a dozen races with ever-changing combinations of abilities that affect how you play the game. At the start of the game, each race is paired up with a random special power. Each race has an ability, for example trolls have extra defense in their regions. Similarly, the special powers that the races are paired up with have abilities too. For instance, the commando power allows you to conquer regions using less tokens. In addition, each race-power combination provides a different number of race combat tokens. Since the races and powers are randomly paired up, every game will play differently. Players take turns choosing a race-power combination. The combinations are placed in order though, and if you want to take a combination further down the line, you have to pay victory points, which go to the players who take the combinations that you skipped over. Once a player has their race tokens, they begin conquering regions on the map. Combat is non-random, and the conqueror only needs to send in just enough tokens to overcome the defenders and any race, terrain or defense bonuses they may have. While board games and card games can be fun, there is often a need to pick up the pace a little and have a lot more fun with your time. This is where checking out royalslotmachines.com can make all the difference as there is a great deal of fun on offer here. Slots are brilliant fun so start playing and maybe you can be a winner too! Once the player has conquered as many regions as his available tokens allow, he then totals up the amount of victory points he has collected that turn. These victory points come from the number of regions the player controls, plus any bonuses provided by their active race-power combination. The goal is therefore not to conquer the most regions when the game ends, but to control a sizable number of regions each turn in order to earn consistent victory points. But what happens when a player runs out of race tokens? The player will have to spend a turn putting his current race into decline and take control of a new race with its new abilities and special powers. The old race loses its special power and most of its racial abilities, and can no longer be used to conquer new regions. It still counts though when totaling the number of controlled regions every turn for victory points. After 9 rounds, the game ends and the player with the most victory points is declared the winner. A large appeal of Small World is its replay value, since the races and powers are combined randomly every game. The race-power combinations (and the fantasy theme in general) can also be exciting and funny. It's pretty hard to keep a straight face when you're being attacked by flying dwarves or mounted giants (poor horses!). The level of control over combat can also be appealing to some. If you have played Risk and are still cursing about losing 20 units to that lone defender, then you'll love Small World! Overall, Small World is a fun interactive board game that is easy to pick up. The basic mechanics are pretty straightforward and not too much strategy and thinking are required. This, together with the fun theme, makes for a great party game or a nice introduction to the more complex board games out there. As the box says: it's a world of slaughter after all in Small World!